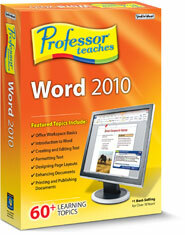 Professor Teaches Word 2010 helps you get the most out of Microsoft Word 2010. This computer learning course was designed by experts to guide you through all of the functions and features of this sophisticated word processing program. You will get hours of lessons using a realistic simulation of the actual Word 2010 program. 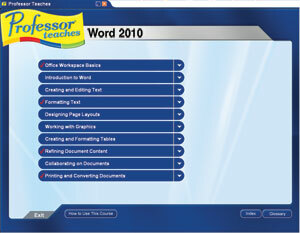 Download the product and start learning Microsoft Word 2010 today! Professor Teaches helps you learn Microsoft Word 2010 every step of the way. Professional voice narration, interactive lessons, and a simulated interface provide an easy transition to the actual Word 2010 program. What is Microsoft Word 2010? 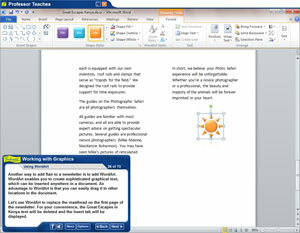 Microsoft Word 2010 is a word processing program that is a part of the brand new Microsoft Office 2010 suite. This program allows you to create high quality, professional looking documents using the finest document formatting tools. Word 2010 provides an improved user experience over the 2007 program and is designed to make collaboration between people more effective. With Word 2010 you can save, edit, share and access documents online from any internet browser. What Are the Benefits of Learning Microsoft Word 2010?